I got to my Mum and Dads house and we were chatting about stuff for this afternoon and things like that. All of a sudden a furry tail appeared out of the bottom of the curtain – now my dad likes his practical jokes so for a matter of seconds it crossed my mind that it was a joke and the punch line would come soon. 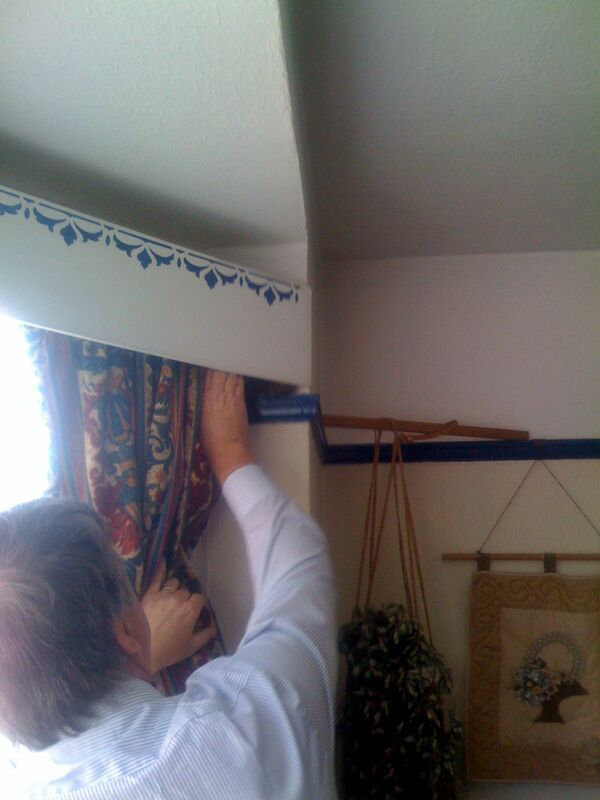 Then the tail disappeared under the board at the top of the curtain. My Dad went and wiggled the curtain and I got this picture. The squrriel charged at the window to try and get out but the window was closed. So it backed up on itself and ran up the curtain. My Dad moved the curtain and the squrriel dropped on the floor and it ran behind the chair and across my feet it ran for the door but ran into the door instead as my Mum had closed it. My Mum stood there really calm (I half expected her to scream or at least freak a little bit). The squrriel ran behind the sofa and either got stuck or decided that there was safe enough to catch it’s breathe. Dad shouted out instructions to close the doors to other rooms and then open the front door on his cue (or should that be on his mark seeing as we’re watching Star Trek Nemesis). Dad moved the sofa and the squrriel got spooked it ran for the open living room door and then past me but ran towards the kitchen did a U turn realizing the front door was open and went for it. Bit of team effort!!! Woop woop!! LOL! That reminds me of when a bird got inside our office building. They cornered it to the IT manager’s office and closed the door (when he was out of the office). When he came back to work, he wondered what all the bird seed was doing all over his office. I guess someone forgot to clean up after they got the bird out.